Donate to Free @ 3: -------- Your support is very much appreciated! 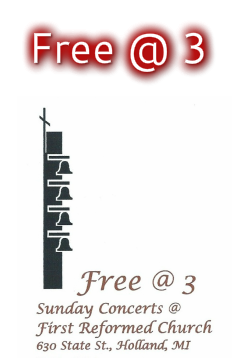 The Free @ 3 Concert Series is held on various Sunday afternoons at 3:00 in the sanctuary of the First Reformed Church in Holland, Michigan. These concerts are open to the public and are free of charge. First Reformed Church was founded in 1847 when immigrants from the Netherlands built a log church in what is now Pilgrim Home Cemetery. The present building on the corner of 26th and State streets was built in 1962 and houses a thriving musical congregation. The sanctuary boasts a beautiful Mason & Hamlin grand piano which is used in many of the Free @ 3 concerts. It is also the home to a four manual, 39 rank, 1962 Casavant/Rodgers pipe organ. The chancel was remodeled in 2013 in part to accommodate the various musical groups which perform on the Free@3 series. Please check out our schedule of concerts and plan to attend as many as you can. Click here to find out how you can make a donation to help us to continue providing these high quality concerts. sunday, April 28, 2019 - 3 :00 P.M. The last four concerts of the current Free@3 season have happened to feature piano trios. On Sunday, April 28 at 3:00 P.M. a new group will take the stage at First Reformed Church, Holland. All 3 performers are well-known chamber and orchestral musicians in the area. Violinist Haiijin Choi and pianist Emily Grabinski are series veterans. Cellist Igor Cetkovic makes his first appearance. The program consists of 2 works – the Piano Trio written by Jennifer Higdon, one of today’s most highly-regarded composers, and a “blockbuster” from the standard repertoire, the Piano Trio by Anton Arensky. Choi is a member of the Grand Rapids Symphony, teaches at Calvin College, and appears in the Grand Rapids Art Museum series and at the Chamber Music Festival of Saugatuck. Cetkovic is Principal cellist for the Kalamazoo and Saginaw Symphonies, Assistant Principal in West Michigan Symphony, and cellist in the Burdick-Thorne String Quartet. and in great demand as a collaborative pianist. the Engels Family Endowment Fund, Anonymous Donors, and the Joan Conway Charitable Giving Fund. 630 State St., Holland, MI 49423, with a designation to Free@3. Joan Conway is founder/Artistic Director of the Free@3 concerts, which began at the Herrick Library.